A garage can be a neglected, unused, and dirty space. Aside from being used for parking vehicles or extra storage, a garage is like a blank canvas and can be used for many different things! 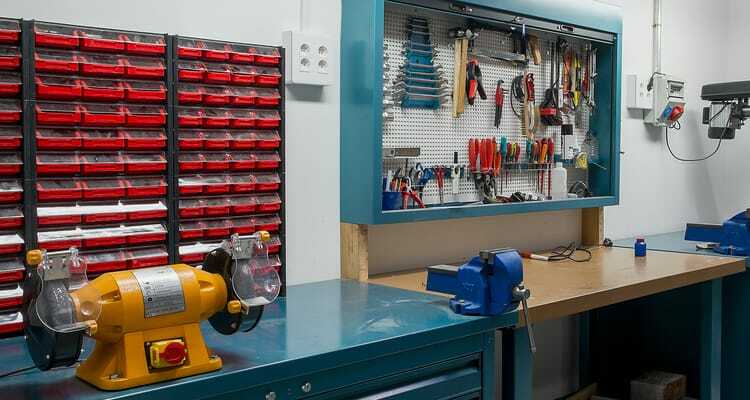 With a little imagination, organization, and some good old-fashioned know-how, you can get more use out of your garage than you think! Here are several creative ideas for other ways to use your home garage. Creating a work out room is one of the more popular alternatives for garage space renovations. Especially if you’re a regular gym patron, turning your garage into a gym is not only more convenient but also saves you a lot of money and gym membership fees in the long term. Just find your favorite pieces of equipment, consider some foam padding or carpet tiles for floor exercises, add a fan for proper ventilation, and throw in a radio to keep you musically motivated! A crafting room is like the ultimate “DIY cave.” By adding a large crafting table to the center of the garage and shelves or cabinets for crafting supplies, any Pinterest pupil would love the extra area. Most garages have electrical outlets, so installing a TV to keep you inspired won’t be an issue, and you have to have a way to plug in the hot glue gun! A garage crafting room is a perfect place for painting, and with a large open area, makes ventilation (from paint fumes) and clean up a breeze! Also known as a ‘man cave,’ although many women enjoy sports just as much as men do, a sports cave is another popular option for other ways to use your home garage. Think; pool table, dart board, large screen tv, couches, side tables, bar table, mini fridge, or a second full-size fridge, it’ll all fit in the garage! Decorate the space with your favorite sports team banners and find rugs or carpet tiles in matching colors! And much like the various sports seasons, think multi-purpose! Game day tables that turn into poker night tables, air hockey that converts into ping pong, pool, or more… the ideas are endless, but you’ll have a space for sports all year around! Don’t have a home office inside the house? Now you do! Convert your garage into a home office by bringing in a desk or folding work table, rolling chairs, your computer, and even add a metal filing cabinet for important information. You can add shelves for books, awards, or products related to your job and use storage bins for supplies. Also, consider a mini-fridge and coffee maker to keep from making frequent trips to the kitchen! Be sure that your internet works in the garage or simply add a wireless router for slower connections. And if you have a side door leading into your garage, you also now have a separate entrance for clients to use for appointments or meetings! Are you in a book club, wine club, networking group, or maybe you’re the leader of a Girl or Boy Scout troop? Sometimes homes are not ideal for large group gatherings, but a garage is a great alternative to the perfect meeting space! For this type of space, having plenty of seating options are key, and having a table to sit at and discuss things around is a plus. Find old couches, folding tables, and chairs, and maybe even bring in a blackboard or dry-erase board for brainstorming ideas with! Depending on the type of meeting or group, you can also decorate the space with inspirational posters, pictures, or use rugs and cozy pillows for a comfortable added touch. There are plenty of other ways to use your home garage and these are just a few suggestions. With a little ingenuity and some simple inspiration, you can have your own space to yourself for whatever ways you choose!